The Awks They Turn North-Eastward. They're Taking the Vulcans to Alderaan! I’m calling Oracle out on this. I spent the first 5 years of my career working with Oracle and I used to like them. Now though the only regular interaction I have with them is unticking the “would you like to install the Ask toolbar?” box every time there’s a Java update. It does not give a good impression. Installing software isn’t something that’s particularly well understood by the man on the Clapham Omnibus. There is a certain fear that if you don’t do what you’re told then the software might not work properly. So most people just accept the defaults on the basis that this should work. There is also the factor that software updates often ping onto your screen when you’re in the middle of something else. So you want to get it out of the way quickly. Again this tends to make people just click the defaults. If you do that here you end up installing a piece of extra software that has nothing really to do with Java other than it being owned by Oracle. What’s more it’s something you almost certainly don’t want. I have no problem with vendors advertising their other products in an install sequence and I don’t have any problem actually with them offering to install it. There are two things that I do consider bad practice. Failing to clearly distinguish that you would be installing something other than (or as well as) the product you initially intended. Installing the software by default. The default should be not to. 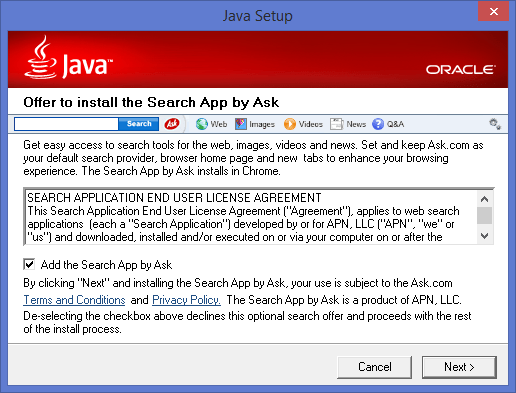 Oracle isn’t particularly bad on the first one, one could say that the dialog looks like you’re accepting the licence agreement for Java but actually it’s reasonably clear. Oracle are a little marginal here for me. There are far, far worse offenders out there. The second however is a straight red card. No way should an installer by default install something that the user didn’t ask for. Please tidy your act up, Oracle. This entry was posted in Life, Technology on 2014-10-15 by Tom Fosdick.